..................... Mary Hopkins – "Those Were the Days"
...................we remember eating our pizza at Atillio's on 46th and 9th. The Soviet Union shocked the world in October 1957 when it launched the first orbital satellite, Sputnik and furthered its lead in space technology when, in April 1961, Cosmonaut Yuri Gagarin became the first person to orbit the earth. Gagarin’s single orbit was followed closely by the August 1961 record flight of Cosmonaut Gherman Titov, who during twenty-four hours in space made a total of seventeen orbits around the globe. Expectations in the United States, therefore, were high as NASA attempted to place the first American in orbit and observe his reactions to the space environment. 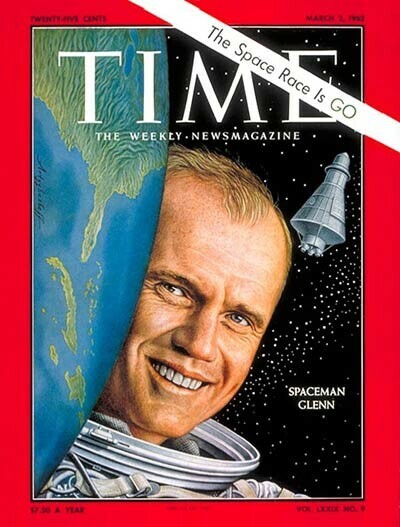 It was John Glenn (subsequently Senator from Ohio) who orbited the earth aboard Friendship 7 on February 20, 1962. The flight was broadcast live on television to millions of people around the world. An estimated four million people turned out in NYC in the cold on March 1st 1962 to cheer John Glenn as he rode in a open automobile tickertape parade. school to attend the John Glenn parade. Their request was denied by Principal Seymor Sundick (yes, that was his name). Noone recalls exactly how many of us cut school that day, but cut school we did. Phil, Kathy and Nick recall being there, as do others. They got a viewing spot near St. Patrick's Cathedral. They recall what looked like a million New Yorkers cheering and throwing confetti out of the office buildings that lined the parade route that day. There was an exhilarating feeling in the air as John Glenn rode by in the motorcade. In hindsight, our memories of attendance far outweigh the punishment we got when they arrived back at school. Some of us think that Mr. Sacher jumped in to insure the punishment was not too severe. ...................we remember playing spin-the-bottle at Susans apartment off 52nd and 8th on her sunken living room floor, when her parents and her brother had left the house. In hindsight , some of the funniest things that happen to us in life are things we are unaware of at the time. Early on in seventh grade we were in Spanish class, and Ms Cornyetz asked Phil to get up and recite the days of the week for the class. Phil got up at his seat and proceeded : Lunes, Martes, F BOMB (in Spanish) , ...Sabado, Domingo..... and sat back down without cracking a smile. Eugene burst out laughing which quickly got him a dirty look from Ms Cornyetz, so he quieted up quickly. When the class was over Phil was called to the front of the room where Ms C told him to study his days of the week some more and to not speak to anyone in Spanish about anything on Wednesday until he did so. When he got outside class, his buddy Eugene was waiting for him and told him that he had told the teacher F U in Spanish. Back in the day, Koop had this thing for Sheila. When he was around her it would actually leave him speechless. Nick and Phil were leaving a year early to attend Brooklyn Tech. Nick wanted to ask Sheila to the 1962 prom, but felt he couldn't ask her face to face or on the phone. Phil suggested he call Susan and have Susan check with Sheila as to whether she would accept before Nick asked her. So...one afternoon from Nick's kitchen he called Susan (with Phil standing nearby listening). Susan listened and then said she would check it out and call back. 10 minutes later she called Nick back and informed him that Sheila would indeed accept. Nick later mustered up the courage to approach Sheila at school and the date was set. ...Story not over yet - in 2003, when we get back together and retell this story, Susan and Kathy chime in that what was even funnier was that all the girls were over Susan's house and had listened in to the entire conversation....including Sheila ! The “local” movie theatre for the neighborhood kids was the Tivoli located on 8th Avenue just north of 50th Street. The Tivoli had a 35 cent budget matinee on Saturday afternoons. Usually the guys would walk together and the girls would walk together and everyone would meet in the theatre. Younger kids like us were forced to sit downstairs, while high school kids were “allowed” to sit in the balcony. This wasn’t policed by the theatre, it was policed by the high school kids in the balcony. Through the late 50’s and the early 60’s the matinee favorites were the horror movies, usually those cheap Hammer movies from Britain. To keep us kids in line a hunch back woman in a grey clerks frock, armed with a flashlight and a mean back hand, roamed the aisles confiscating pea shooters and telling kids to shut up or to stop throwing pop corn or candy. This “ Matron” would actually boot you out if she was ignored or provoked. Without question the nastiest gross out you could lay on someone in the neighborhood was “...oh yeah....well your mother is matron at the Tivoli”. Those were fighting words. ....we remember when Alton split the seam in his pants and prayed all through Spanish class that he would not have to get up and recite...he left class with his shirt tied around his waist. 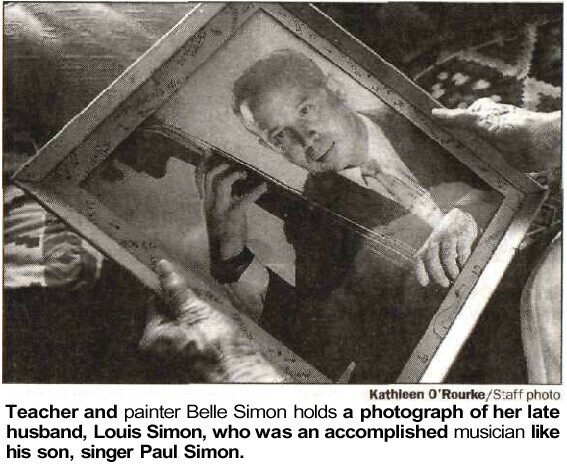 Mr. (Louis) Simon, a Hungarian immigrant, was our 7th grade English teacher who lived with his wife, Belle, and two sons in Kew Gardens Queens. He was an accomplished musician who went back to school in the US to earn his Masters degree in teaching. He was a bass player who appeared regularly on CBS TV shows such as Arthur Godfrey, Jackie Gleason and Gary Moore under the pseudonym “ Lee Simms”. When he heard the 8th grade "GO Council" was preparing for the fall dance in 1962 he suggested that perhaps he could get his son's musical group to play for the dance. His son and a close friend had been writing and playing together since they themselves were in Jr. High under the name “Tom and Jerry” [borrowed from the Hanna/Barbara cartoon characters of the same name] they actually had a song hit the charts in 1958 when at the age of 17 they sang “Hey School Girl “, which reached 49 on the top 100, on American Bandstand. Paul and Arthur indeed played the fall 1962 GO dance for the LaSalle kids. They played “Hey School Girl”, “Anna Belle’, “Play Me a Sad Song”, “I Want to be the Lipstick on Your Collar” and “Motorcycle for Amy”, all songs Paul had written as well as a lot of Chubby Checker twist numbers and lots of other songs of the day. Margo even recalls dancing with the 21 year old Paul during one of their numbers. As we all went home that night, after the dance, none of us anticipated that in a few years Paul and Arthur would get signed by Columbia records and record the #12 single of 1966, “Sounds of Silence”. We were witnessing the beginning of the brilliant career of Paul Simon and Art Garfunkel. Sometimes when the guys would leave school at lunchtime, they would cut over to Broadway on 47th Street and go to Playland Amusement Center. It was the Playland in that little triangle of land that exists between Broadway and 7th Avenues. You entered it on the Broadway side and could exit straight across on the 7th Avenue side. It had numerous lanes of “skeeball”, pinball machines and other venues of entertainment. As you entered the front door you saw the "Hombre". He was, a full size mechanical man, dressed in black like a cowboy, with a 3 day growth painted on his face , a neckerchief pulled up over his nose and a real cowboy hat on his head. As you came close his head turned towards you and he said “Hombre, think you're fast?…..think you can take me ?…. come on and try" (or something like that) He repeated this speech and mechanical motion about every few minutes until someone dropped a quarter in the slot and challenged him. The goal was to draw a gun which was in a holster attached to a pole which was bolted to the floor and shoot a light beam at the hombre (and hit this round glass area in his chest) before he drew his gun from his holster pointed at you and pulled the trigger. If the beam hit him first he let out a “Ohh you got me….let's try again”. If he shot first, he let out a “you're dead, hombre…care to try again?” You got 3 turns before your quarter was used up. If you won you got arcade game points (like you got for playing skee ball) which could be turned in for cheap prizes. In the spring of 7th grade Eugene accidentally leaned on the Hombre's shooting arm which caused something to "click" and the game started up without depositing the 25 cents. We would use this little quirk in the game many, many times over the next two years, when the clerk was not looking to get in many, many free games. 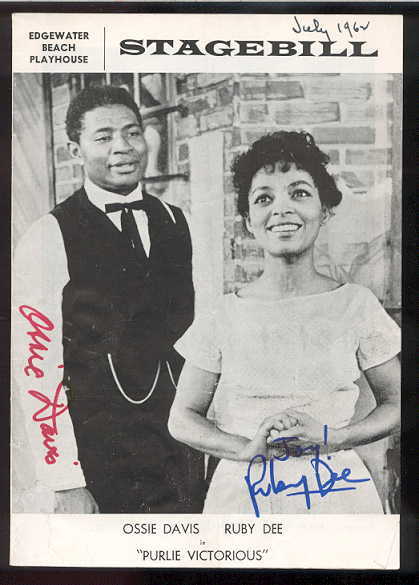 We remember Mr Braunstein taking us to see Purlie Victorious on Broadway and then taking us backstage to see Ossie Davis and his wife Ruby Dee in person. Murray Braunstein was, and remains a mentor to many of us. In fact, to this day, he still calls us "his kids". He was a young teacher when we first met - much younger than we are today, but he shared his passion for learning with us, and he encouraged all of us to become the very best we could be. In other words, he sold us on the American Dream - "... You can be whatever you want to be if you work at it hard enough" . He invited us into his home for splendid meals (he could carve a turkey and put the entire thing back on the frame! ), and helped to build the camraderie we still enjoy. 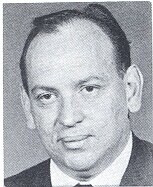 Herbert Sacher was our Science teacher and homeroom teacher for class 9-1. He is the reason that many of us followed a path into the sciences. He helped us start up a Future Scientists of America club, and he let some of us do "experiments" in the little stock room / lab that he kept on the top floor. His son Seth was born while we were in 9th grade. We found Mr. Sacher by locating Seth outside Washington, DC. We are grateful for the time that we got to spend with him at our 2003 NYC reunion, our trip to Kathy & Paul's in 2004 and his trip to join us in New Mexico in 2004. While he shared drinks and laughs with us on Margo's portal overlooking Santa Fe, he may have already known that his cancer would take him soon, but he did not let on. Thanks for everything Herb ! ¡Hola, Paco! ¿Qué tal?.......Bien gracias, pero Luisa tiene catarro.......Lo siento mucho. ¡Hasta luego! We also vividly recall memorizing the words to "Estas son las mañanitas". So vividly, in fact, that at the 2003 reunion we could all sing it together....and did! It's amazing that you are all involved after all these years!. I celebrated my 81st birthday last June! 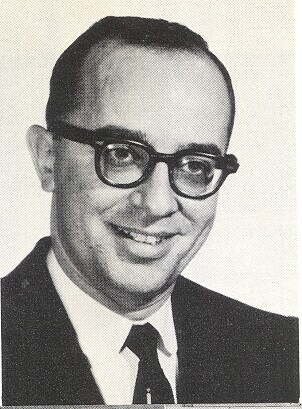 Louis Simon (deceased) - 7th grade English teacher. On the side, he played bass for many of the CBS shows such as Arthur Godfrey, Jackie Gleason and Gary Moore that were produced near our school (under the pseudonym Lee Simms). While we were in 8th grade he arranged for his son Paul and his band to play for our fall school dance. The band "Tom and Jerry" would, a few years later, become better known as Simon and Garfunkel. 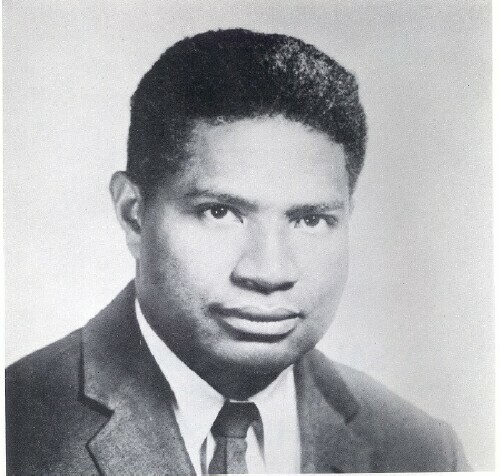 The LaSalle JHS 17 1963 yearbook was dedicated to our special friend Ossie Davis. Ossie and his wife Ruby Dee were good friends of Mr B's. Ossie visited us often and got our 8th grade class tickets and backstage passes to his Broadway play "Purlie Victorious". 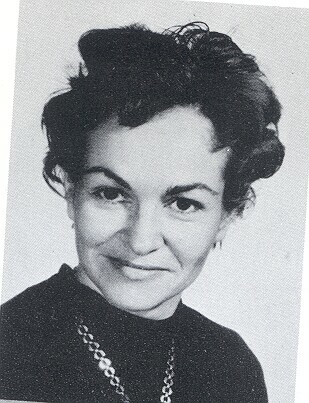 Our yearbook inscription was as follows " ....We dedicate our yearbook to Ossie Davis who personifies in his community responsibility the high ideals of which he writes...who always has time for children despite the hour or the press of obligations...we dedicate our yearbook to Ossie Davis...playwright...star and good neighbor."